Legacy Building Solutions, a leading designer, manufacturer and installer of tension fabric buildings – in collaboration with the Midwest office of general contracting firm McTech Corporation – has received a Design-Build Institute of America (DBIA) Project / Team Award for the new South Satellite Service Center building in Kansas City, Missouri, US. The honour will be presented at the DBIA Mid-America Region awards celebration on 16 October. The DBIA award recognises exemplary application of design-build project delivery, resulting in highly successful projects that achieve best value while meeting design and construction quality, cost and schedule goals. The judges for this year’s awards included two owners, one architect, one contractor and one engineer. The South Satellite Service Center was engineered, constructed and installed by Legacy Building Solutions, which is exhibiting at booth #321 at the National Design-Build Conference and Expo in Dallas, 6-8 October. The tension fabric building, owned and operated by the city of Kansas City, was designed to house 8,000t of salt and sand for winter road maintenance. The enclosed facility features a high-quality, translucent fabric roof mounted on a 10ft-high, cast-in-place concrete wall, and includes large side doors for drive-through capability. 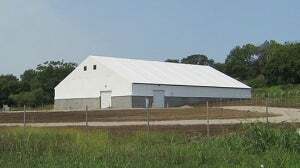 Measuring 100ft by 160ft, the fabric building provides ample room for loading and unloading trucks under roof, while also leaving additional space for liquid storage and a working area. "It was a pleasure to partner with our entire design-build team on the project," said Ali Karimi, senior vice-president at McTech. "Legacy’s staff was very professional from onset of the project and very easy to work with. We are looking forward to the next great project!"